My boyfriend has this add-on room on the back of his house and has been unfinished from the inside for years. So I decided to start the process of finishing it here and there myself. I don't have many tools to work with and what tools I do have are old and a few I bought for little things around the house or I bought just when I was working on a project to get me by. 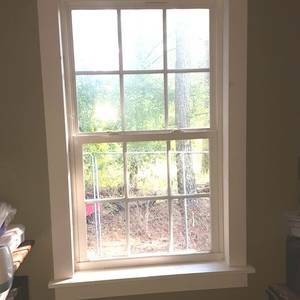 We had the sheet rock up and the window installed but was unframed and not finished out and I wanted to hang curtains instead of an old blanket hanging to cover the window. Needless to say I went to it and I have to admit for the first one it turned out pretty darn good for me. It looks like it turned out really great!